Normally I wouldn’t combine two race write ups but this is a rather unique case. I always like the start of these events, you can feel the anticipation and nerves all around you. I had a stretch goal of 11 hours and a plan B of 11:30 (10 mins slower than my PB) and at the start was reasonably confident that I would be able to achieve at least plan B, I was wrong. The race started and we were all off, the start is pretty flat when comparing it to the rest of the North Downs and its a good opportunity to ease into things and keep the pace reasonable before hitting some of the more challenging sections. The first 6 or so miles to Aid Station I felt fine, it was getting warm but it was manageable. It was after leaving this that the voice started, a hell of a lot earlier than usual. In anything that pushes you towards your physical limits there will come a point where a voice in your head will start to tell you all sorts of negative things, normally this doesn’t happen until later on, usually half way. The heat was really starting to drain me, it still being early in the day this was worrying me. I felt like I was struggling to take on enough fluids and salts (I spent most of the day feeling sick) and the other thought was “you have to run a marathon tomorrow”. I had failed at the 100 and the thought of failing this was a big worry for me. I was lucky to have Gareth crewing for me and meeting him at aid 2 cheered me up a bit, as did the coconut water he carried. Once I was off again the negative thoughts started to creep in again. I tried to suppress these as much as possible but it was turning into a drag and I could already see plan A and plan B slipping away with me just hoping for a finish within the cut off. 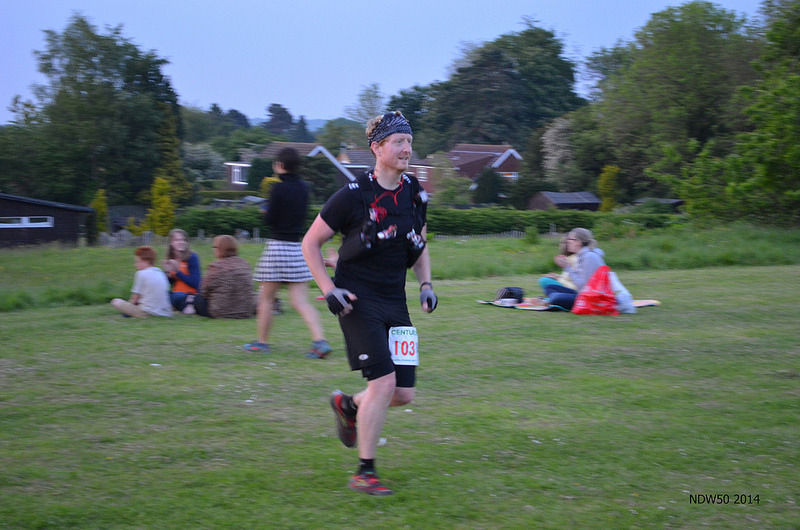 I forget where but I met up with Garry who I ran a large proportion of the NDW100 with last year. He was running with a friend, Karen, who was doing her first ultra and the chat lifted my spirits. They were progressing well and tried to keep the pace with them but I felt myself slipping behind. Rather than make a song and dance about it I let them carry on ahead (sorry both if I didn’t say goodbye, I just didn’t want you to feel obliged to hang around) and got my head down to plod forward. 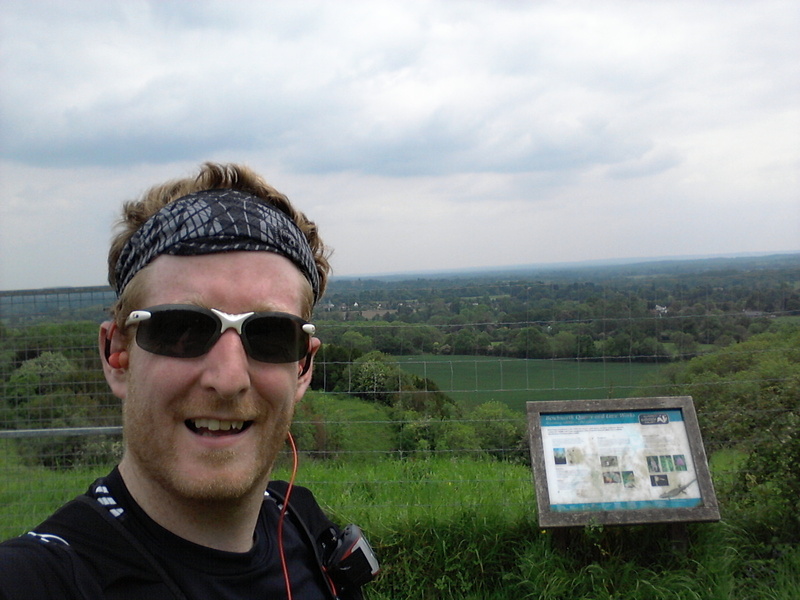 This mental struggle continued through Box Hill, Reigate and Caterham (a good proportion of the race!). Each time I would reach an aid station or a meeting point with Gareth, have some more food and water and carry on. I started to feel more positive from Caterham to Botley Hill, despite my slow pace I had enough time left that I was fairly certain that I would at least finish under the cut off. Botley Hill to the finish at Knockholt Pound my feelings would range, I missed a turning which was a set back and several fields had rather a lot of cows who seemed to be intent on blocking my way. Also, for those who have done the race before or know the route, this section seems to take forever and is really mentally draining. Each gate you pass through you hope for the road which will lead to the finish and instead you are presented with another field, it can be quite demoralising. I did finish however and made it within the cut-off, my time being 12:41:59, pretty much at the back of the fields and widely off my targets but crossing that line was just the best feeling. As usual the organisers had put together another brilliant event and the volunteers who manned the aid stations made it all the better, their enthusiasm and willingness to help is what can make the difference between someone giving into the desire to quit or pushing forwards. I didn’t have time to reflect on the day, I had to focus on getting as much food and rest as possible for the following days challenge. Sore, that’s how I felt as I got out of bed that morning. I had been luck on the 50 in that I had no blisters on my feet and chaffing around ‘sensitive’ areas was minimal (although still noticeable!). I had already prepped my gear so it was a case of getting up and getting dressed. Gareth was running the marathon as well and he picked me up around 7am. After sorting ourselves out at the race start and waiting for 09:30 for things to kick-off it had become very apparent that today was going to be warmer than yesterday, something which I really wasn’t happy about. I had used bottles in my Inov8 race vest on the 50 but for the marathon had switched to the bladder, which had 2 litres of electrolytes in it. This combined with the aid stations was hopefully enough to see me through and prevent any dehydration issues. The race started Gareth and I had set off together, the pace was slow and running was something which my legs were very much telling me not to do. I can’t remember where I first said it but I told Gareth it was ok if he wanted to shoot off ahead, he was after all going much slower than he would be able to on his own. To his credit he said he would stick with me and even when we had to adopt a run/walk strategy very early on. 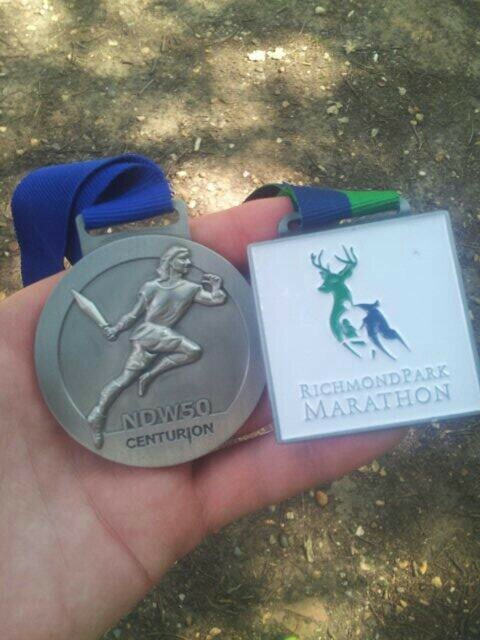 The Richmond Park Marathon route was split into a 12 mile twisting lap around the park followed by two 7.1 mile laps. There were several aid station points dotted around the course and as per previous day the enthusiasm of the volunteers was fantastic. Also, they were bordering on Ultra style aid stations, with Flapjacks, Banana’s, Jelly Babies and Apples to name a few so that really helped perk me up. On the first 12 miles the section from mile 9 to 12 was really quite tough, it was along the middle of the park and was feeling the full brunt of the sun, with little to no shade. It was here that I really started to doubt by ability to continue, my legs were dead and each burst of effort to run was becoming harder and harder to maintain. Gareth continued to motivate and pace (drag) me along and we had a quick pit stop at his car to grab some fluids and then crossed the 12 mile mark. As we approached the end of the first lap you had straight on for the second lap and a turn right for start/finish. The crowds were cheering as other runners were coming to the end of their marathon, Gareth and I carried on straight much to our amusement. It was the last lap where Gareth and I agreed he would run off ahead. There was plenty of time for me to finish at the pace I was going and mentally I was in a good place. There was part of me that wanted to run alone as well, I wanted to just put some music on and take myself away from the pain and exhaustion. This was probably the most emotionally varied 7.1 miles of my life, one minute I was ready to collapse and the next I was holding back tears of joy. I distinctly remember crossing mile 24 and realising that finishing was a certainty, it was then that I almost burst into tears. This happened again at 25 and 26, with the last 200 yards being a long drag over the line. Gareth was at the end waiting and I think I was a bit delirious as I couldn’t really make any decisions on anything (other than I wanted to sit down for a bit) so Gareth sorted me out some food and drink. It was a long day and I finished in 05:45, the race itself was so well organised and the volunteers who worked the aid stations and marshalled were all brilliant, I would absolutely do this race again (maybe not with 50 miles the day before though). 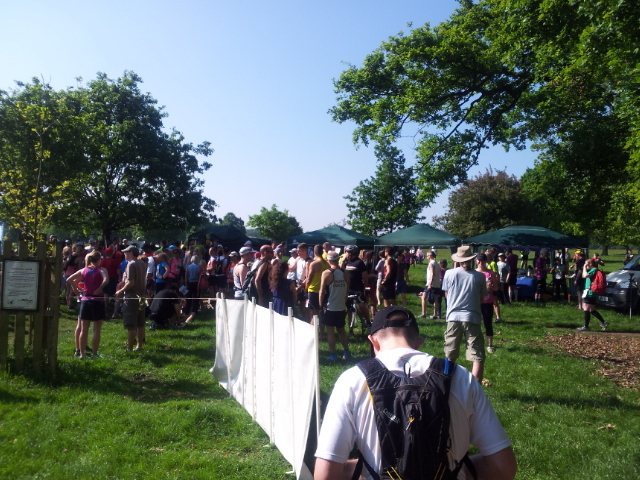 Centurion events are always amazingly well organised and this year was no exception, the aid stations were well stocked with fantastic volunteers manning them and the medical support on the day was fantastic (I didn’t have to use it but witnessed it being used). 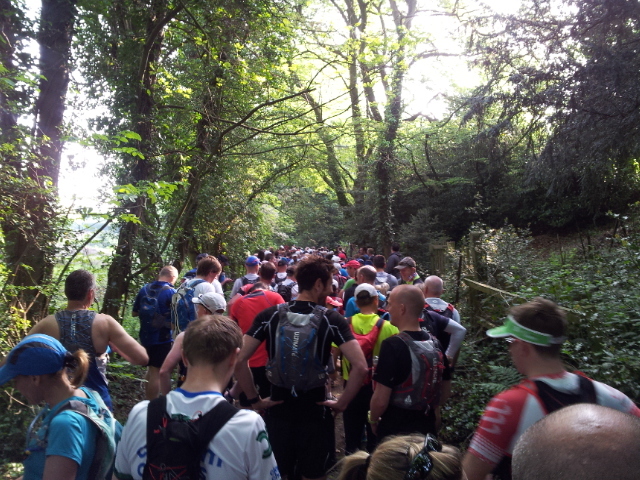 If you are planning a 50 or 100 mile Ultra into Ultra running a Centurion event is one of the best. The two days were hard, that’s a given, but they were harder than they should have been. This is in part due to the warm conditions and the lack of opportunity to acclimatise, but the real reason is I didn’t train enough and didn’t train smart. My longest run up to that day was about 19 miles which simply isn’t enough, I think to an extent I was complacent given that I had run the distance before and didn’t appreciate how I would be affected. As well as my training progress I am going to try to get some more reviews of various bits of kit posted as I have let this slide as well and I have several items that have had some serious road testing. The Fan Dance is fast approaching and I have my fingers crossed that the weather improves, I was hoping for snow but this seems unlikely now so I will settle for dry. Quick post, kit is now sorted, drop bags are packed. A good meal tonight and as much sleep as I can muster. 6 am tomorrow I hopefully run further and longer than I ever have before, the weather looks ok so that’s one less thing to worry about.